It's exterior is nondescript, perhaps to the point of almost being boring. Inside, however, is an intimate space whose walls are lined with chalkboards listing out the menu, drinks, desserts, and childlike doodles. To the left is a small bar fronted by a long rectangular coffee table. To the right is a beautiful open kitchen surrounded by stools for those lucky enough to get a seat watching the action. We were in Serpico, Stephen Starr's new restaurant headed up by James Beard Award winning chef Peter Serpico. The excitement and suspense was building up as we perused the menu, devouring each plate as our eyes scanned each dish from top to bottom. Placing our order, we first received the house-made rice cakes with sesame seeds. 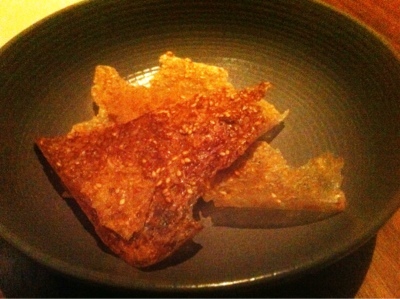 As crunchy as they were, the rice cakes were devoid of flavor. Some were overly burnt while others were overly salty. Not a great way to start. Next out were the raw diver scallops and deep fried hoisin duck legs in a potato roll. 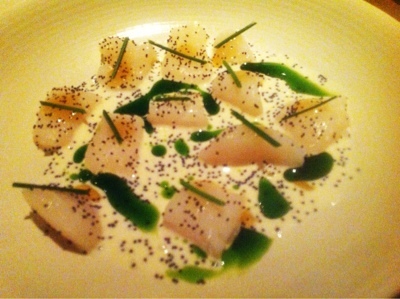 The former was served with buttermilk, poppy seed, green chili paste, white soy, and chive. 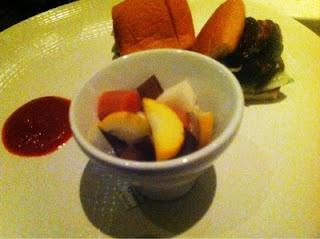 The latter had an accompanying bowl of various pickled vegetables. The scallops were buttery smooth, providing a refreshingly cool start to the meal. The crunch and warmth of the deep fried duck legs were a welcomed contrast to the scallops. I normally don't like duck, but this had barely any of the ordinary flavors of duck, especially when you drizzle on some siracha. The hand torn pasta and caper brined trout were next. 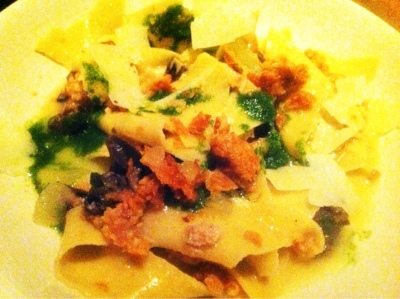 The pasta came mixed with chicken sausage, braised snails, and crispy chicken skin - all flavored with garlic, Italian parsley, and a dusting of pecorino. The trout came layered on top of a potato salad, pepperocini, and chive oil. Large pieces of blue crab sat at the bottom. 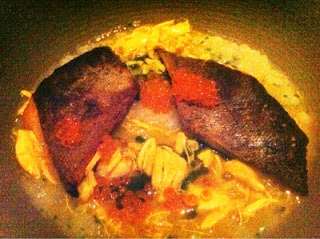 Like tiny orange marbles, chunks of trout roe topped the trout. The potato salad made every bite as smokey as a chimney. Serpico offers both semisweet and sweet desserts. You can check out the semisweet desserts yourself since we decided to go with the sweets - all three of them. 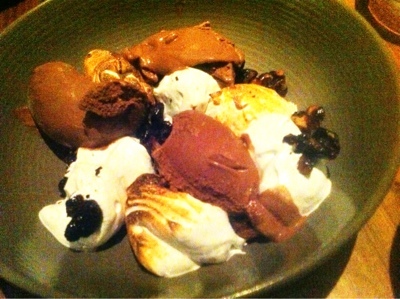 The rocky road came with chocolate pudding, toasted marshmallow, and candied walnuts. Unfortunately, that's exactly what it was - nothing more, nothing less, and slightly disappointing. 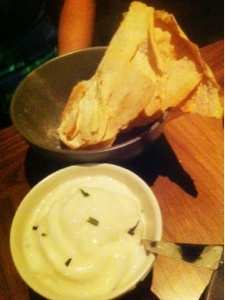 The yuzu curd consisted of lemon foam, whipped cream (at the bottom), and fried rosemary. Chamomile crackers were provided. It was like an alternative version of the Brits' biscuits and tea. I was not a fan of the flavor profile - the fried rosemary threw me off, and yuzu in general isn't one of my favorite things. The toasted apple cake was, fortunately, good. 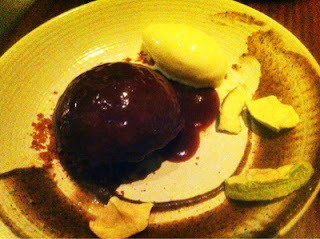 Burnt apple cake lined the perimeter of the plate (don't eat this by itself) like a half moon. At first, the apple cake looks like a brownie, but no worries, it's an apple cake. A delicious one as well. Serpico - a great addition to Philly. Come for dinner, but maybe pass on dessert. At least for now.